The Jewish holiday of Hanukkah begins tonight, Nov. 27, 2013 with the lighting of the first candle in the Menorah. That means that the first day of Hanukkah is Thanksgiving. 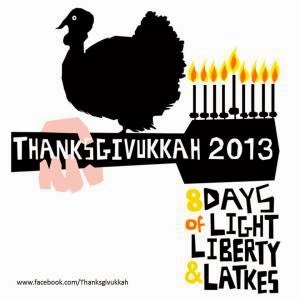 This has given rise to a new word: Thanksgivukkah! I checked out the obvious question: How often do Hanukkah and Thanksgiving come together? The answer: Less than rarely. Way back in 1861, the fourth Thursday in November coincided with Hanukkah. But that doesn't count, since President Lincoln did not declare Thanksgiving to be a national holiday until 1863. When will it happen again? Almost never. I take that back ... With built in adjustments to both the Hebrew and Gregorian calendars to keep them “on track,” various calculations have determined that won’t happen again for somewhere between 70,000 and 78,000 years. Why do the Jewish holidays seem to move around so much? For one thing ... we were wandering Jews for years ( no ... not the plant). Remember when Moses found us the only piece of the desert without oil? We settled. Okay ... the real reason is because the Jewish calendar is a lunar calendar with adjustments for the solar calendar. A solar year is defined as the time it takes for the earth to circle the sun. Because that time span is slightly longer than 365 days, every four years there is a “leap year” which adds another day to February in order to keep the calendar from drifting away from the seasons. The Hebrew calendar follows the cycles of the moon, each new month beginning on the new moon. But since the lunar calendar is shorter than the solar based Gregorian calendar, adjustments need to be made to the Hebrew calendar. In order to compensate for the shorter year and keep the Hebrew calendar aligned with the solar, a 13th “leap-month” is added to the Hebrew calendar seven times every 19 years. So ... you now have been educated way beyond every Jew I know. When you bite into that turkey tomorrow, you might want to whisper to the person next to you to pass the cranberry and latkes.